On July 24th two yachts met in the cold waters of Baffin Bay at 74°N, a place where only a handful of intrepid sailors have gone before them. 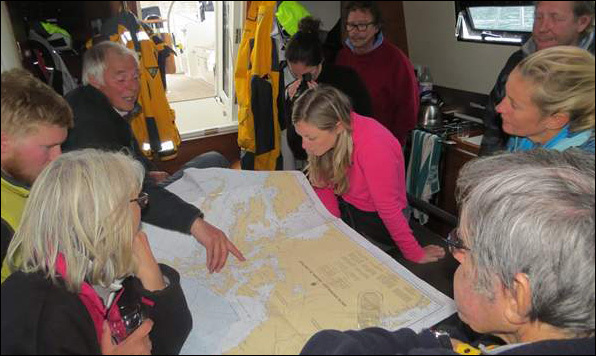 After 18 months of preparation, finally the Northern route of the Blue Planet Odyssey was a reality. 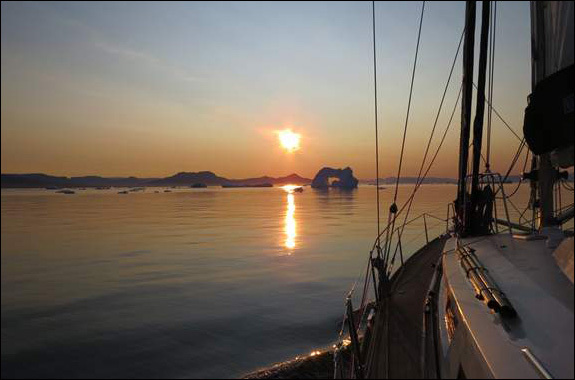 The two yachts taking the 2014 Northern route, Aventura and Suilven, had been playing catch up since both left Disko Bay on the west coast of Greenland on Saturday 19th July. Suilven had anchored in a bay and joined Aventura shortly after she sailed past, through the narrow channel north of Disko Island, dotted with impressive icebergs, and out into the Davis Strait. 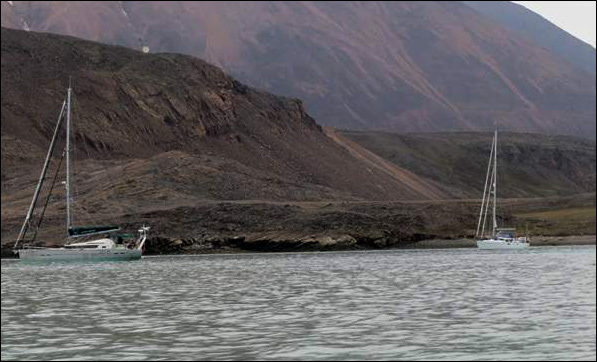 The two boats kept radio contact, but only on the final day of the 500 mile passage made visual contact. As the impressive mountain scenery of Canada’s Bylot Island came into view to port, at the entrance to Lancaster Sound, and marking the real start of the Northwest Passage, John Andrews of Suilven and Jimmy Cornell of Aventura agreed by VHF to draw closer together for a unique photo opportunity. Winds remained light as the forbidding coastline of Devon Island drew nearer on the northern side of the Sound, its mountains capped by a thick ice sheet feeding several glaciers pushing down into the sea. The brown rocky slopes blasted by the icy Arctic wind looked like the most desolate place on earth. Accompanied by curious northern fulmars wheeling around the boats and the occasional harp seal poking its head above the waves in surprise, the two boats headed for Dundas Harbour, a protected anchorage along the coast of Devon Island (Lat 74°31’ N, Long 82°30’W) . The original destination, Bethune Inlet, further east, had to be abandoned as the most recent ice charts from the Canadian Ice Service showed it to be thick with ice. This will probably not be the last decision to be dictated by the ice, as a successful transit through the notorious Northwest Passage depends entirely on how the ice melts and in what direction it moves. For this reason the crews are consulting the ice charts daily. As those who have been following the Blue Planet Odyssey will know, the Northwest Passage has only been navigable by vessels other than icebreakers for the past few years, due to rising temperatures in the Arctic and a gradual but unrelenting diminishing of the sea ice. This sea ice has defeated countless hardy explorers through the past centuries who dreamed of a route connecting Atlantic to Pacific. 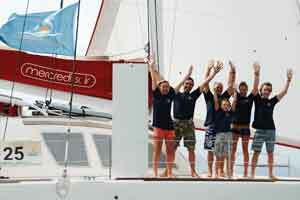 It remains to be seen how the Blue Planet Odyssey yachts will fare, as they join a small number of other yachts attempting the passage this year. And indeed, there she was – the powerful white head and body low in the water. As Aventura’s crew watched, she gave them an irritable glance and slipped onto the beach and up the rocky shore. Watching that powerful, beautiful creature, perfectly adapted for this harsh and unforgiving climate, one is left with two thoughts: how easy it is for us today with our electronic charts, radar and daily ice charts. 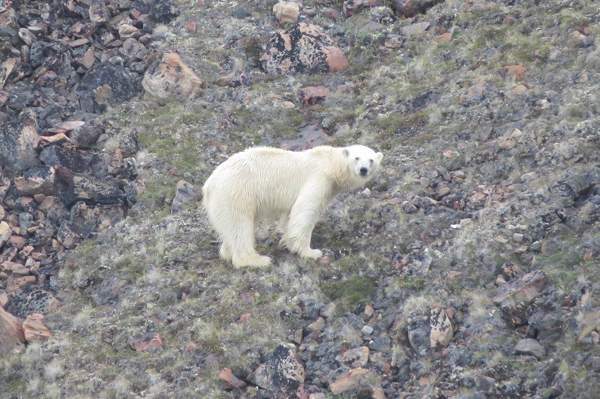 Second, the Odyssey is here to raise awareness of climate change, and what more potent a symbol can you find than a polar bear, gaunt from the lean pickings of summer, climbing the dry slopes of a barren hill. If the Arctic ever becomes free of sea ice in the summer, what will be the ice bear’s fate?